As featured in the April edition of delicious magazine! A stunning celebration cheese cake made from 4 tiers of the finest artisan cheese. As featured in the April issue of delicious Magazine! Is it a cake? Is it cheese? The answer is both. A 'cake' made from stacked cheeses makes a spectacular talking point for a party or wedding. This celebration cake combines the best in colour, texture and taste for a mouth-watering celebration centrepiece. The top layer of Finn has a soft double cream-like texture. It tastes lactic and velvety when it's young but as it matures, it develops complex walnut and mushroom flavours. There is one round of Finn for the top of the cake and 3 others provided to serve. Second in the tiers comes Sheep Rustler. A semi-hard ewe's milk cheese with a medium, mellow flavour that's slightly nutty with a hint of caramel. Third is Single Gloucester; a traditional cheese, handmade using the milk of Gloucester cows. Mild, creamy and slightly lactic in flavour, it's best eaten young. The base layer is Shropshire Blue. A smooth-textured blue cheese with a rich, rounded flavour and distinctive blue veining throughout the russet interior. 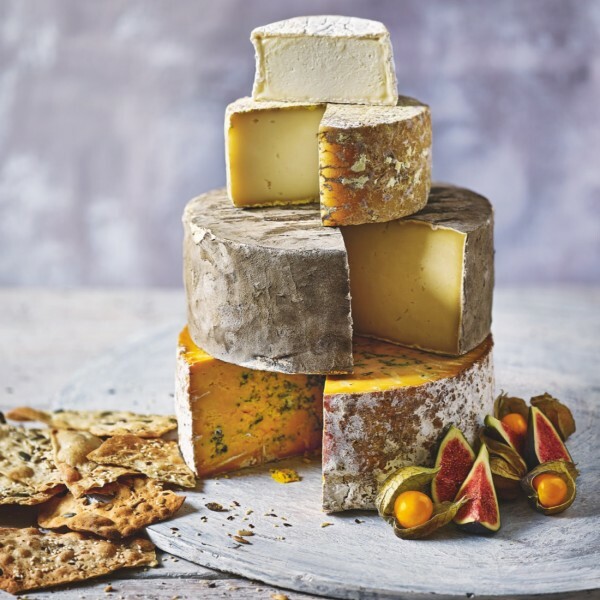 Stunning as a cheese wedding cake, or for any celebration. Decorate your cheese with seasonal fruit or edible flowers for a wow-factor finish. Total cake weighs approx 6KG and serves approximately 50-60 people. Please allow 3 weeks for the creation & delivery of your celebration cheese cake.